Recently, a friend of ours Raymond Magourty, commonly known as Raymondo, was given the opportunity to work the harvest for a Mas Doix, a prestigious wine producer in the town of Poboleda who’s recent Parker Points have elevated it in popularity, is located in the Priorat. With his background in wine, and desire to learn more about about the Priorat, the winery took him on as an apprentice during the harvest. Hence over the next few months, Raymond will be chiming every now and then with his day to day experiences working a Cataluna harvest! To see his first article, go here and second article, here. Today we crushed the young vine Garnacha Negra ‘Grenache’ (approx 10 years) that we picked yesterday. We then transferred the ‘must’ into tank where it will ‘settle’ overnight. All grapes from all vineyard parcels at Mas Doix are hand harvested by a small experienced picking crew using secateurs and gathered in plastic stackable 20 litre containers – the size specified by the D.O. of which more another day. We employ a simple and effective technique to ensure that the grapes are cool prior to crushing; the fruit is picked in the early morning before the afternoon sun heats things up, we then transport it back to the bodega, weigh it, and store in a refrigerated container. The big question. The decision as to when to harvest grapes is typically taken by the winemaker or winemaking team and informed by the level of sugar (measured in ÂºBrix), the acidity and pH of the grapes in each vineyard parcel. 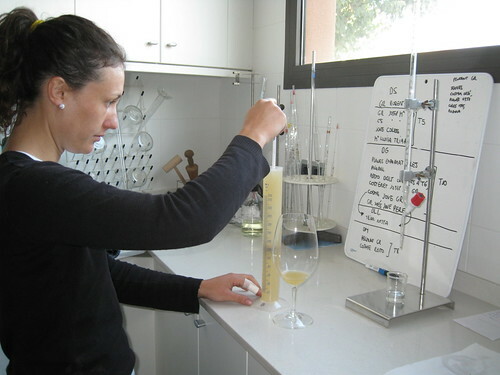 The ÂºBrix can tell you the potential alcohol of the finished wine. In the weeks leading up to and throughout the harvest the team regularly visit each vineyard parcel and gather samples. At Mas Doix we criss-cross the rows gathering individual berries from clusters at differing elevations, levels of leaf cover and exposure. The objective is collect a sample of grapes that represent the overall composition of the vineyard. Later in the lab each vineyard sample is crushed and the juice analysed to determine the density, the acidity, and the pH. Other factors specifically phenological ripeness, berry flavour, tannin development, seed and stem are also considered and the weather forecasts are always taken into account. But above all and most crucially we taste the grapes to determine the readiness for harvest; this is where the real art/expertise lies. The winemaking team needs to be prudent in weighing up all variables at play in order to also ensure that a scheduled harvest day coincides with the availability of a picking team – you often find many wineries within the one region harvesting on the same day with everybody looking for pickers at the same time. This year has been very tricky. The excessive heat spell during the last two weeks of august and the unanswered prayers for rain have meant that there are huge variations in ripeness within the same vineyard. Barrel topping is one of those tasks that looses its magical appeal almost seconds after you’ve done it for the first time. At Mas Doix 98% of our production is red wine and weÂ currently make 3 labels ‘Les Crestes’, ‘Salanques’, and the flagship ‘Doix’, of which more anon. EachÂ of these reds is aged, to a greater or lesser degree, in French oak barrels of 225 litres. We vinify the varieties and parcels separately and the old vine and younger vine parcels separately. The barrels are stored vertically with the fill hole pointing directly up. Once the barrels are filled to the brim with wine destined for aÂ term of oak ageing a curious but essential process gets underway. Over timeÂ a certainÂ amount of wine evaporates andÂ is lost through the oak staves of the barrels, this is known in the world of winemaking as the ‘Angels share’, we don’t begrudge them this. So at regular intervals we have to replace the wine that the angels have consumed in order to ensure that there is minimal oxygen contact with the wine in barrel during the ageing process. Oxygen plays a crucial role throughout the winemaking process but if not carefully controlled during barrel ageing Acetobacter can use oxygen in the headspace to transform a wine into vinegar – not good. So we Â´topÂ´ or refill the barrels every 4 weeks or so, every 2 weeks if the barrels are new and it’s a first-fill, to replace that which has evaporated. The process is often slow andÂ laborious and at Mas Doix we’re old school and do it all by hand with a topping jug. It’s as simple as it sounds – remove the bung stoppering the fill hole to prevent oxidisation and pour in more wine of the same provenance to replace that which has evaporated. We also taste samples to check the evolution of the wine in barrel. After about 50 barrels of slowly and carefully repeating the refill process one is quiet satisfied not to have to do it again, alas 4 weeks later your back. Angels! To see more photos from Raymondo’s harvest, go to his Flickr account.